Place a deep pot on the stove and add the milk, coconut extract and sugar. Cook at low heat. In a large bowl, combine the 1/2 cup of water with the cornstarch and stir until the mixture turns white. When the milk first reaches its boil add the cornstarch mixture and mix with a spoon until reaching a viscous consistency. 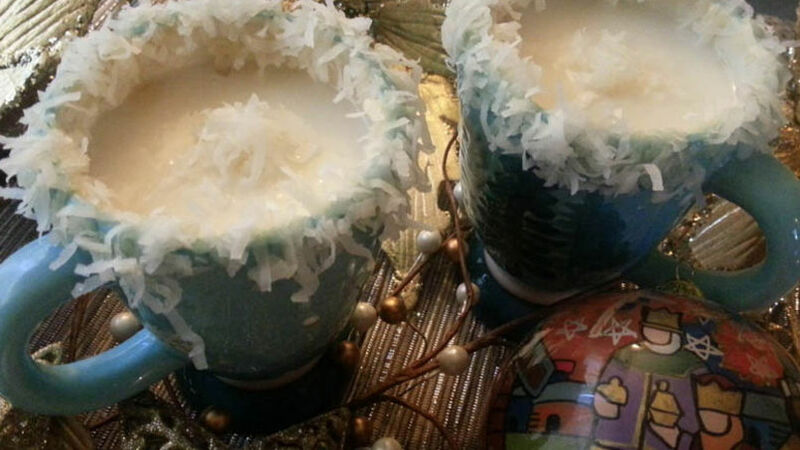 Before serving the atole, frost the cups you’re going to use with the shredded coconut. To get it to stick, use the honey. Serve the atole very hot with a piece of rosca de reyes. You can change the flavor by using almond or walnut extract. You can also use coconut milk or almond milk instead of cow’s milk. Atole is a traditional Mexican drink typically served for the celebration of the eve of Three Kings Day on January 5th. The traditional rosca de Reyes is another classic dish for this holiday, as well as green, red, rajas, mole and sweet tamales. It’s a wonderful tradition for the whole family. This time of year always brings me such sweet memories of my childhood, which is why I have introduced my Cuban family to these traditions. Now my family and my young grandson enjoy and await this festivity after every Christmas. My family really enjoys coconut, so when I prepare the menu for our Three Kings dinner I always include coconut atole, and this is the recipe I’m sharing with you today. Enjoy!